For a person of faith whose beliefs are rooted in the Bible, there is no place on earth like the Holy Land. For centuries, Christian travelers have been transformed while visiting this narrow strip of land where events of the Old and New Testaments took place—scenes we have pictured in our minds since Sunday school. Because of the country’s compact size, places of religious significance are not far from each other. A week touring Israel can be a life-changing experience, one from which Christians will return home with a deeper and more committed faith. The following sample itinerary begins in historic cities along the Mediterranean coast and heads north to the Sea of Galilee area before moving back south to the Jordan Valley and Dead Sea. 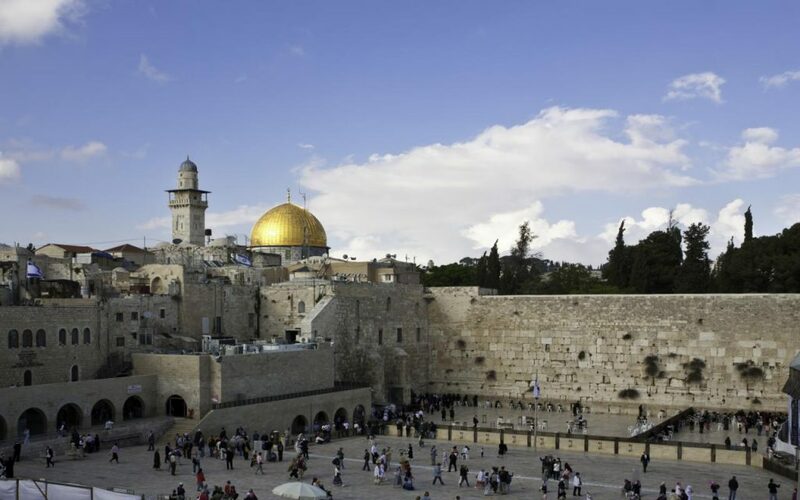 Your eye-opening week climaxes with three days in Jerusalem, the highlight of any Israel tour. Begin your journey by heading to Jaffa, the picturesque Mediterranean port from which Jonah set sail before being swallowed by the whale, where King Solomon imported the cedars of Lebanon to build the Temple in Jerusalem and where Peter had his vision at the home of Simon the Tanner. The Visitor Center in Kedumim Square, a site built around antiquities from the time of Jesus, showcases the history of Jaffa. Drive north across the Sharon Plain to the excavations of the ancient city port of Caesarea. From this site, now a national park, Pontius Pilate ruled the country. King Herod built Caesarea in honor of his patron, Emperor Augustus, in the mid-first century B.C. Peter’s story continues in Caesarea when Peter baptized Cornelius the Centurion. It was from this port that Paul set sail to preach in communities surrounding the Mediterranean Sea and where Paul was later imprisoned for two years and appeared before Felix, Festus and King Agrippa. All these events are reflected in the ruins you’ll tour, including the Roman theater, hippodrome and Herod’s palace. You can also see mosaics and other remains from the centuries when Caesarea was an important Christian center with its Crusader walls, moat and gates. Continue north to Mount Carmel and hike in the nature reserve around the Kelah River. The evergreen-laden Carmel hills are known as “Little Switzerland.” Bird’s-eye lookouts and picnic stops are scattered along the scenic routes, where you can enjoy sweeping views of the Jezreel Valley to the east, the Upper Galilee to the north and Mediterranean beaches to the west. Drive through the Ara Valley to Tel Megiddo, the Armageddon of Revelations 16:16. Tour the remains of one of the most consistently inhabited sites in the country with over 25 levels of civilization settlements, spanning some 3,000 years, including walls, gates, palaces and dwellings from the time of King Solomon, King Ahab and the Assyrians. A walk through the water system reveals one of the engineering marvels of the ancient world. Cross the Jezreel Valley, Israel’s breadbasket, to Mount Tabor and learn about the prophetess Deborah gathering her forces during the time of the Judges to battle against Sisera. Jesus came to Tabor with Peter and James, was transfigured before them, and met with Moses and Elijah. After enjoying a breathtaking view of the valley, visit the beautiful Church of the Transfiguration. Continue to Nazareth to visit Nazareth Village, a full-scale reconstruction of life in Nazareth during the time of Jesus. Then visit the centuries-old Church of St. Gabriel, which houses the village spring – one of the few remains from the time of Jesus. Drive across the Galilee mountains via Cana, the scene of Jesus’ first miracle of changing water into wine and home of Nathaniel. From the Arbel cliff, stop for a view of the Sea of Galilee and scenes of Jesus’ Galilee ministry. 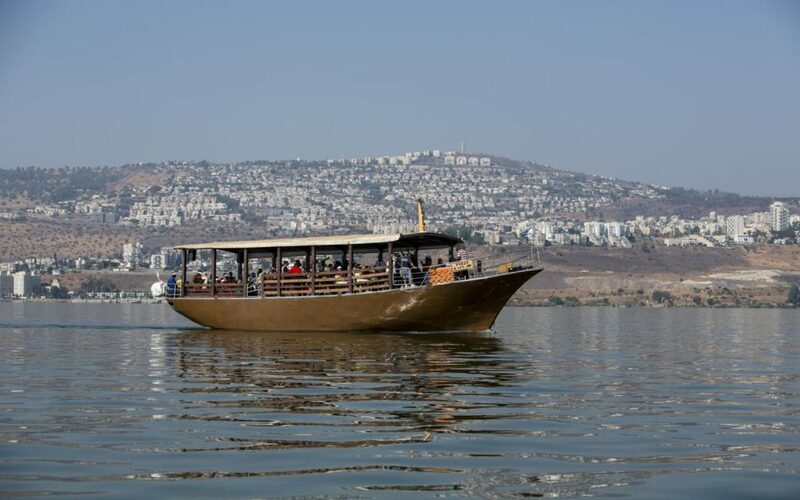 Greet your day at Kibbutz Ginosar to witness the magnificent display of the wooden Galilee Boat dating from the time of Jesus. Continue from Ginosar with a boat ride on the Sea of Galilee, stopping for devotions as waves lap quietly against the boat. Next, stop at the nearby Church of the Primacy of Peter, where Jesus appeared to the Apostles after the resurrection. Nearby is Tabgha, site of the miracles of the fishes and loaves, with its famous mosaic. Continue north to the Mount of Beatitudes, the hill where Jesus preached the Sermon on the Mount to the multitudes below. From here you have a panoramic view of the Sea of Galilee. Continue to Caesarea Philippi, now known as Banias. Enjoy the natural beauty of this area nestled on the banks of one of the Jordan River’s main tributaries. Before you leave the Sea of Galilee area, visit Yardenit, the Jordan River baptismal site at the sea’s southern tip. Traveling from lush landscape to desert terrain, toward the Dead Sea, the lowest point on earth, you will be struck by the changing scenery. Visit the well preserved Crusader fortress, Belvoir Castle. Built in the 12th century, it stands on a plateau high above the Jordan Valley. remnants of this city, the capital of the Decapolis cities where the Gospels say the fame of Jesus spread during His ministry. Continue down the Jordan Valley, seeing Jericho as you travel through the wilderness of Judah to the Dead Sea. Stop for a float in this mineral-laden body of water at one of the many beaches. site became a symbol of strength and heroism. Drive along the Dead Sea to the oasis at Ein Gedi, where David hid from King Saul, and hike to a desert waterfall. 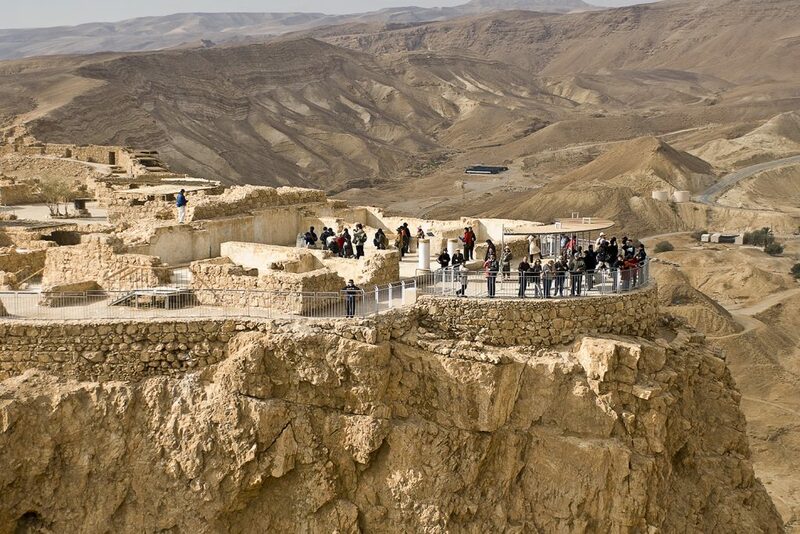 Visit Qumran, where the famed Dead Sea Scrolls were found. If you’re on the main road from Jericho to Jerusalem and it’s before 4 p.m., take a break at a 19th century Turkish building called the Inn of the Good Samaritan. The museum features an open-air display of mosaics and archaeological findings from both Jewish and Samaritan synagogues, as well as Christian churches, including cisterns and remnants from the reconstructed Good Samaritan Byzantine Church. Before heading to your hotel in Jerusalem, stop for your first view of the Holy City from Mount Scopus, and open your Bibles to read, “Our feet are standing in your gates, O Jerusalem” (Psalms 122:2). Jerusalem’s water from the Assyrians when the city was under siege. Stop at the Pool of Siloam, where new excavations have uncovered the remains of the pool where Jesus healed a blind man. Explore the Southern Temple Excavations at the southwestern corner of Temple Mount. Here you can stand on the very street that Jesus would have walked 2,000 years ago and view other archaeological remains that shed light on New Testament events. At the magnificent Davidson Visitors Center, see the virtual-reconstruction, high-definition, interactive model and enjoy the film that depicts ancient pilgrimage to the Temple. Stop at the Western Wall, the last remnant of the Herodian Temple Mount destroyed by the Romans nearly 2,000 years ago. Schedule a tour of the Western Wall Tunnels, also called the Rabbinical Tunnels. Stroll through the alleyways of the Jewish Quarter, including the Cardo, which was the main street of Byzantine Christian Jerusalem. Start the day at the Israel Museum, home to the most important archaeological discovery of the 20th century – the Dead Sea Scrolls. An impressive model of Jerusalem in 69 B.C. sets the stage before entering the special shrine that contains the Scrolls. Stop at the square opposite the Knesset to view Israel’s legislature and see the magnificent bronze menorah with its carvings depicting the biblical history of Israel and Zechariah’s immortal words “Not by might, nor by power but by My Spirit” (Zechariah 4:6). Continue to Mount Zion and its many sites, including King David’s Tomb and the Coenaculum, the Room of the Last Supper. Despite its name, King David’s Tomb could not be the actual burial place as King David was buried in the City of David. As it is, the tomb, a recent (medieval) site, is strangely situated in the same Crusader building that houses the traditional place where the Last Supper was held. 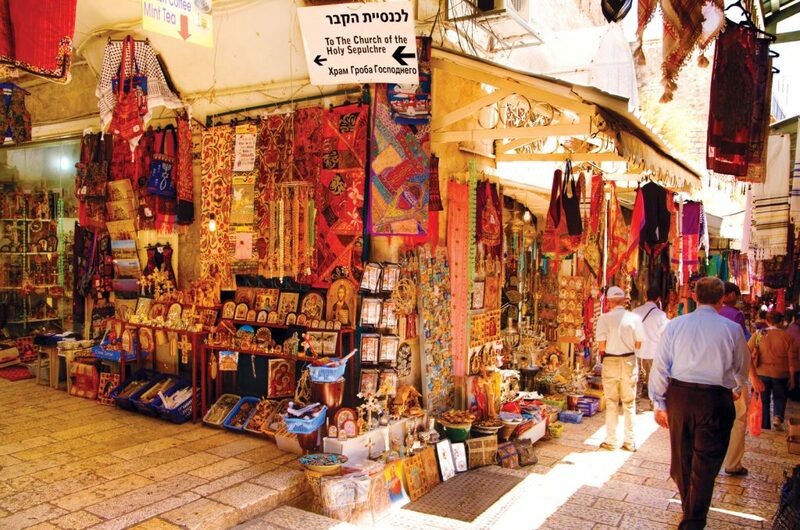 Wander the Old City markets, steeping yourself in its sights, sounds and aromas, and try your hand at bargaining. Visit Yad Vashem, Israel’s official memorial to the victims of the Holocaust, with its astounding new historical museum, Hall of Remembrance and Children’s Memorial. Welcome the day with one of the most magnificent views in the world: ancient Jerusalem as seen from the top of the Mount of Olives. Allow time to visit the various churches on the summit, among them: Pater Noster, where the prayer “Our Father” is inscribed in dozens of languages, and the Church of Ascension, marking the place where Jesus ascended to Heaven. Take the “Palm Sunday Walk” down the Mount of Olives in the footsteps of Jesus. At the Garden of Gethsemane at the base of the mountain, ponder the time Jesus spent here with His disciples before His ar-rest. See the floor-to-ceiling mosaics in the impressive Church of Gethsemane, known as the Church of All Nations. Enter the Old City via Lion’s Gate, also known as St. Stephen’s Gate, to the Pools of Bethesda, where Jesus healed a paralytic ( John 5: 2-9). Visit St. Anne’s Chapel, the purest Crusader church in the entire country, where Christian groups love to sing praises to the Lord. Stroll down Via Dolorosa, the street where St. Anne’s is located and where Jesus walked from the place of Pontius Pilate’s sentencing to Golgotha. The last path of Jesus ends in the Church of the Holy Sepulchre, where Orthodox and Catholic Christians mark His crucifixion and burial. The day will end with a visit to the Garden Tomb. Located north of Damascus Gate, this ancient cemetery has become a touching site in which to recall the crucifixion and burial of Jesus and spend time in prayer, song and fellowship.